Labels | | Industrial Marking Services, Inc.Industrial Marking Services, Inc.
Labels - Industrial Marking Services, Inc. Whether it is an aluminum label giving the washer and dryer its brand name identity, the warning label instructing the heavy equipment operator to watch his or her step, or the operator controls on today’s complicated military aircraft, custom labels deliver the messages for operational safety and regulations. Businesses use labels for commercial, industrial, retail products and programs. Labels are used to educate, instruct, identify, advertise and communicate. 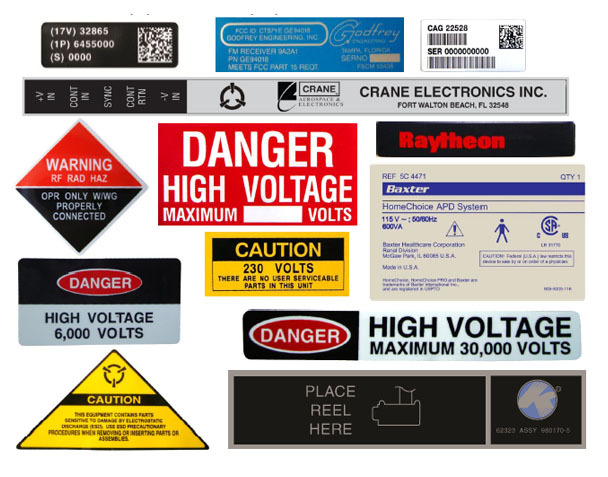 There are a variety of labels that can be produced: UID barcode labels, packaging labels, caution labels, safety and danger labels, instruction labels, informational labels, thermal transfer labels, UPC code labels and many more. Custom labels come in all shapes, sizes and vary in cost according to your requirement. Labels can be printed on a variety of extremely flexible and durable surfaces for indoor and outdoor purposes. Light-weight plastic, aluminum, paper, polyester, polystyrene, polycarbonate, lexan and vinyl are some of the materials Industrial Marking Services use to create labels. These custom labels can be laminated, direct imaged, screen printed and can be custom shaped with special made dies. Labels are available in all forms and finishes such as rolls, individual pieces, multiple sheets or strips. The different types of finishes include transparent, brushed, metalized, reflective, tamperproof, fluorescent or phosphorescent.